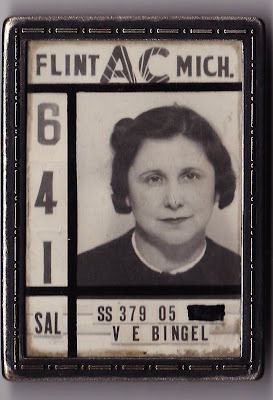 Vida Bingel's AC Spark Plug employee badge from sometime in the thirties. John Bingel writes: My Grandmother, Vida Bingel, worked at AC from sometime in the '30s until she retired in 1965. She was born in Montrose in 1900 and graduated from Montrose High School in 1917. My Mother worked at AC through the WWII years. I'm surprised they put her SS# on ID badges back then--especially since (according to the card) the numbers are "not for identification." I was about to join a neighborhood video store in Little Rock, Arkansas in the early '90s until I found out they put your social security number on the membership card. And my student ID number in college was my social security number, printed boldly on the I.D. Well, how convenient for them! 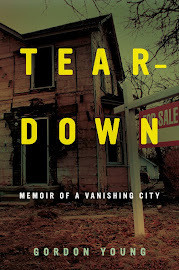 By the way, how do we know that you are really Gordon Young, Flint expatriate? Got any proof? Let's see some id, young man. yeah, a nice chip just under the skin is the next step. my son got a metal detector for x-mas and we found something that says ac flint on the back. We live in suffolk, va. Anyone have any ideas on what it might be?